As the NHL lockout drags into the month of November, hockey fans across the world (meaning Canada) find themselves in the same frustrating predicament as 2004: No hockey. Why is this happening? That doesn’t really matter. It seems that every sportswriter in Canada has attempted to explain the lockout to fans. The following is a perspective from a fan attempting to look at the far larger picture than the dreaded HRR (Hockey Related Revenue). It is appropriate to clarify that my position as an NHL fan is mostly formed by my love for the Toronto Maple Leafs rather than the love for the sport itself. There is no amount of money someone could pay me to watch a Phoenix and Columbus game. Much of my love for hockey comes from the sense of ritual and tradition that every sport attempts to create and maintain. Things like Hockey Night in Canada and Bob Cole’s voice have a hold on my passion for the game far more than back-checking or that wonderful moment when every game stops so two men can fight for no apparent reason. Bob Cole, a Saturday night staple. This brings me to the first core issue of the NHL lockout that has me frustrated beyond belief. Much of the nostalgia and sentimentality that informs my passion for hockey comes from an idealized version of a hockey player that is now shattered. From horrible Tim Horton’s commercials or the ridiculous hyperbole of commentators like Pierre Maguire, everyone in Canada has been inundated with the caricature of a tough, committed, unrelenting athlete that would gladly accept bodily harm just for the sheer thrill of lacing up a pair of skates and participating in the cultural touchstone that is a hockey game. Basketball players are notoriously wimpy [Ed. note: Absurd]. Football players come off as steroid specimens, motivated to knock their opponent unconscious. Baseball players look like Prince Fielder. Hockey players, however, love the game and we love them for that. Not anymore. Sitting out an entire year not even 10 years ago is pretty terrible but we accepted it because the league and its players were arguing over a fundamental shift in how they game would be played and organized. This time, not even close. Instead we have 700 petulant players halting the league because their currently un-guaranteed million-dollar contracts are under threat of being… un-guaranteed. The Doug Gilmours, Lanny McDonalds, Phil Espositos of professional hockey are long gone. Sadly, what the NHL players are reduced to in my mind is akin to that feeling when you realize you just aren’t in love anymore. The heroes of my childhood are just like anyone else. They do not inspire me anymore. Similar to the moment when you realize your favorite artist is a hack/sell-out, the athletes of the NHL have become nothing more than the cheap corporate puppets they are attempting to show the world they are not. This brings me to the second core issue of the NHL lockout: Greed. A different kind of face off. There is nothing more demeaning to the loyal fans of a product than millionaires and billionaires fighting over millions and billions. All the while fans plead with the players and owners to start playing again so THEY (the players and owners) can continue making millions and billions. The 2012 NHL lockout has been entirely successful in revealing the inherent and entrenched problem of professional sports for any average fan. We go to games, fork over cash for overpriced everything, spend countless hours watching on TV, spend more money on specialty channels and most importantly, endure the agony of defeat. For all this, like any human interaction, we just want know the feelings of care and devotion are mutual, or at least appreciated. 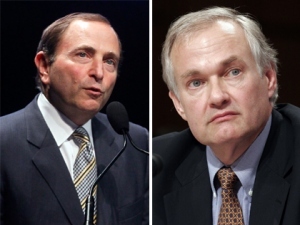 The NHL lockout has revealed for me the sad secret of professional sports: they really do not care. In Alberta, a man named Travis Dhanraj is pleading with the NHL and its players to end the lockout so he can watch one last game with his dying father. This is what fans do. For us, it means something. We care to the point where it defines logic and reason. We love our teams and our sports in spite of our love for our hard earned money. The NHL and NHLPA have revealed that those in professional sports have only one true love: money. So, Travis pleads with his father to hang onto life and pleads with the NHL on behalf of his father because of the shared memories, traditions, and love fostered by the game of hockey. All the while, Gary Bettman pleads with the owners, and Don Fehr pleads with the players, to hang in there a little longer for a few more millions. No matter when this lockout ends, it has unveiled a dark side of professional sports that I naively presumed wasn’t part of the character of the hockey players and the sport of hockey. The love is gone. Like any heartbreak, you move on, pick up the pieces and normalcy eventually returns. I will undoubtedly return to the couch on Saturday nights for my weekly indulgence of nostalgia, ritual, tradition, and romanticism. However, I will always know that something has fundamentally changed. Although reconciliation is inevitable, it will never be the same. Well penned Paul. Encapsulates my feelings exactly. Go Leafs Go.